JNN 22 Sept 2014 Glasgow : Clashes have broken out in Scotland’s Glasgow between Yes and No campaign supporters following the failure of Scotland’s independence bid. When Scotland decided to stay in the union voting ‘No’ with 55 percent, British unionists took to the streets of Glasgow celebrating Scotland’s decision to stay in the UK. But the rally soon descended into violent clashes with at least 11 people arrested. The scuffles erupted on Friday in Glasgow’s George Square, where hundreds of unionists engaged in a tense standoff with independence supporters. 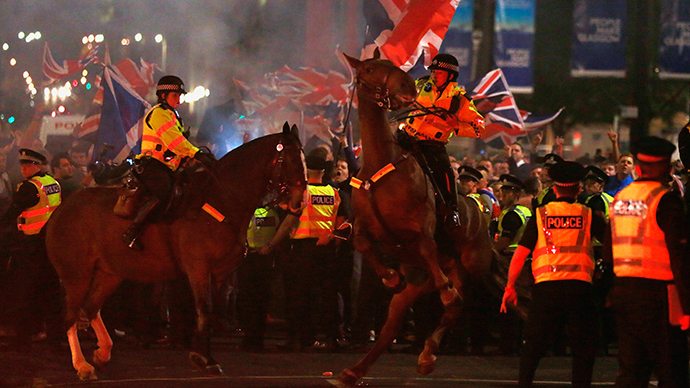 Reports say Union supporters brandished Union flags, while both sides chanted slogans as they were separated by two lines of police. One side sang the national Scottish song, “Flower of Scotland”, while the other sang “Rule Britannia”. “An investigation into Friday night’s disorder has begun and an incident room has been set up at Glasgow city center police office, staffed by officers dedicated to identifying and arresting anyone involved in the ugly scenes witnessed across the world on television and social media,” he said. Glasgow was one of four local authorities that voted yes for independence from the United Kingdom. The confrontation took place after Scottish First Minister Alex Salmond announced his resignation due to failing to secure a majority for independence from the UK in the referendum. Salmond told a press conference on Friday that he will stand down as Scotland’s first minister and Scottish National Party (SNP) leader in November, when the party elects its next leader in a membership vote. The first minister’s remarks came shortly after official results in almost all the 32 council areas of Scotland showed that some 55 percent of Scottish people voted against the country’s independence from the UK in the Thursday referendum. This entry was posted in Europe and tagged Flower of Scotland, Glasgow, independence, independence supporters, No Vote, Scotland. Bookmark the permalink.